The Morgan Library Green Screen Kit is available for a 2-hour checkout in the Library. You can rent out the Anderson Room and hang the green screen backdrop on the hooks at the front of the room. Loosen the knob located at the base of the light stand (4-pronged knob, looks like an X). Apply pressure downwards, pushing towards the floor, as this will extend the legs outward. Lower until the stand is about 1-inch off of the ground. Tighten the knob that was loosened. Using the three remaining (flat-shaped) knobs on the stand, loosen and adjust accordingly. Locate the softboxes and the (4-pronged, slim) softbox rods. Attach the rods to the softbox, by working the rods into the slips inside the softbox. MAKE SURE HEAT VENT IS POSITIONED AT THE TOP OF ULITE. Always keep this open while in use to prevent overheating. Open the softbox by pushing the round center runner towards the lamp socket until flush. BEFORE YOU DO THIS, take off grey ring that is around the lamp socket, and push runner flush; then replace the grey ring around the socket. Loosen knob that is located at the bottom of softbox (tilting bracket). Place bracket onto the top stud of the light stand. Tighten the knob to lock it into place. Make sure the light stand is not plugged into any power unit. Locate the lamp and screw it into the lamp socket. Locate the white diffusion panel (white cover for softbox). Velcro should line up and overlap the softbox to take shape. Connect power, and turn on. Repeat steps for the second light stand. Remove Green Screen Backdrop from case. In the Anderson classroom, there are 3 Command hooks located at the front of the room, by the projection screen. Position the green screen backdrop with the soft side facing outward, silky side towards the wall. There should be some excess green screen backdrop that falls onto the floor. To get a good shot/viewpoint of the screen, the front 2 tables (with chairs) may be moved. REMEMBER to move all desks and chairs back to their original places before you leave the classroom. Power off and unplug both uLites. IMPORTANT: Allow the lamps to cool before proceeding with disassembly. Wait 20 minutes for Photoflood bulbs. Wait 7 minutes for Fluorescent bulbs. Once cool, unscrew the light bulbs and return to their packaging. Unscrew the metal locking ring on the uLite. Locate the round center runner and pull towards you, allowing the softbox to naturally collapse. Locate the thumb screws and turn counterclockwise until the softbox is released from the main light fixture. Separate the uLites from the softboxes and return to their packaging. Collapse the light stands by untightening the knobs described above. Return light stands to kit bag. 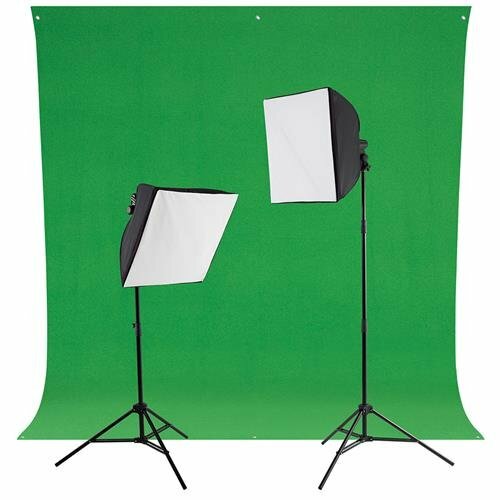 Remove the green screen backdrop from the command hooks, fold, and return to the kit bag. Ensure all components are returned to the bag. The FXhome PhotoKey 6 Lite software is installed on the PC’s in the back right row of the Library Computer Lab. Use this software to edit photos taken on the green screen. You will need to insert the Green Screen Photo Flash Drive for the background photos. To edit videos, try downloading a free video-editing software, such as Wondershare Fimora.